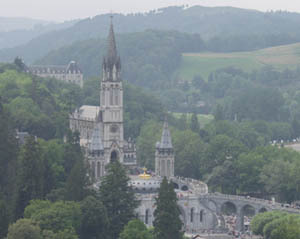 For Catholics, Lourdes is the world's most beloved Shrine. Nestled in a valley in the southwestern part of the Hautes-Pyrenees, it is the scene of pilgrims gathering from all over the world. On February 11,1858, the Virgin revealed herself to a poor shepherd girl, Bernadette Soubirous who was born in January 7, 1844. Eighteen such apparitions were reported. Bernadette, died in a convent in 1879. She was beatified in 1925, then canonized in 1933. Her apparitions literally put Lourdes on the map. The town has subsequently attracted millions of visitors, the illustrious and the povery-stricken. The Church has recognized many "cures" that have taken place after patients bathed in the springs, labeling them "true miracles." 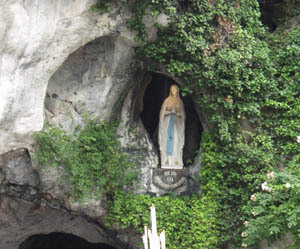 At the Grotto of Massabielle the Virgin is said to have appeared 18 times to Bernadette between February 11 and July 16, 1858. This venerated site is accessible to pilgrims both day and night, and Mass is celebrated there every day. The Statue of Our Lady depicts the Virgin in the posture she is said to have taken in the place she reputedly appeared, saying to Bernadette in Pyrenean dialect, "I am the Immaculate Conception." At the back of the Grotto, on the left of the Altar, is the Miraculous Spring that reportedly spouted on February 25, 1858, during the ninth apparition, when Bernadette scraped the earth as instructed. The Virgin is said to have commanded her, "Go and drink at the spring and wash there." The water from this spring is collected in several reservoirs, from which you can drink. Other Sancturies associated with St. Bernadette include the crypt, the first chapel built on top of the Grotto, the Basilica of St. Pius X. In town, there are the house where Bernadette lived, the Cachot, the baptismal font in the parish church, and the hospital chapel where she made her First Communion. The Upper Basilica, at place du Rosaire, was built in the 13th century ogival style but was not conscracted until 1876. It contains one nave split into five equal bays. Lining its interior are votive tables. On the west side of the square is the Rosary Basilica, with two small towers. It was built in 1889 in the Roman-Byzantine style and holds up to 4,000. Inside, 15 chapels are dedicated to the "Mysteries of the Rosary". The oval Basilica of Pius X was consacrated in 1958. An enormous underground chamber covered by a concrete roof, it has 660 feet long and 270 feet wide, holding as many as 20,000. It is one of the world's largest churches. O ever immanculate Virgin, Mother of mercy, health of the sick, refuge of sinners, comfort of the afflicted, you know my wants, my troubles, my sufferings; deign to cast upon me a look of mercy. By appearing in the Grotto of Lourdes, you were pleased to make it a privileged sanctuary, whence you dispense your favors, and already many sufferers have obtained the cure of their infirmities both spiritual and corporal, I come, therefore, with unbounded confidence, to implore your material intercession. Obtain, O loving Mother, the grant of my requests. I will endeavor to imitate your virtues, that I may one day share your glory, and bless you in eternity.